Reddish-Yellow Beardgrass is a mountain grass with stems densely clustered, geniculate, up to 50 cm. Leaf-blades are flat, 2-6 x 0.2-0.4 cm, tuberculate, hairy along margins; ligule to 0.05 cm. Flower panicles are ovate, up to 7 cm. Stalkless spikelet: lower glume to 0.45 cm, folded, bristly at tip; upper glume to 0.45 cm, densely fringed with hairs on keel, awn to 0.8 cm; lower lemma to 0.35 cm; upper lemma to 0.35 cm, awn to 0.3 cm; callus up to 2 mm. Stalkled spikelet: lower glume up to 4 mm, awn up to 6 mm; upper glume to 3 mm; lower lemma up to 4 mm; upper lemma up to 3 mm. 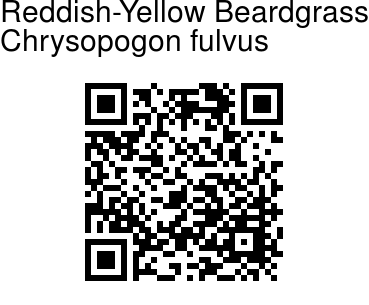 Reddish-Yellow Beardgrass is found in Tropical Asia and East Africa. 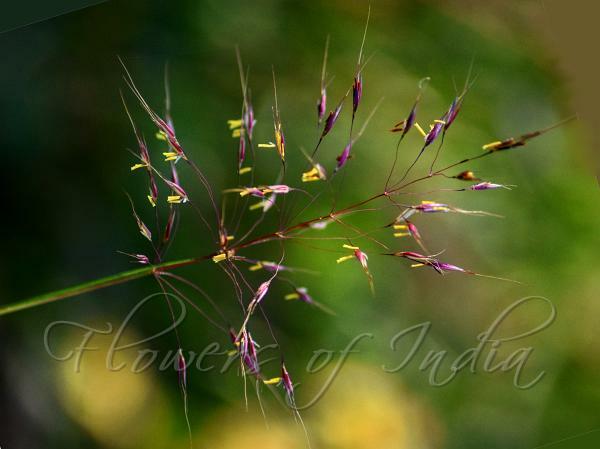 It is found in the lower Himalayas, at altitudes of 300-900 m. Flowering: October-December.